Ken Oberkfell got called up to the Cardinals in the second half of 1978, didn’t hit, began pressing and never did achieve his potential in his brief trial that year. The next season, Oberkfell, relaxed but aggressive, became the Cardinals’ starting second baseman and enjoyed a successful rookie year. Oberkfell, a left-handed batter, hit .120 (6-for-50) after being promoted to the Cardinals in July 1978. 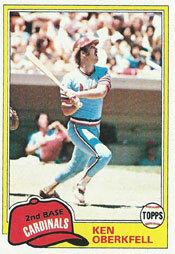 He was one of the Cardinals’ top hitters in 1979 spring training games, hitting better than .300. Still, Oberkfell didn’t have the starting second base job when the 1979 season opened. That belonged to veteran Mike Tyson. “I had one four-hit day in the minors, but it wasn’t nearly as big a thrill as this,” Oberkfell said to The Sporting News. In May 1979, Boyer began platooning Oberkfell with Tyson, a right-handed batter. Fighting to remain a starter, Tyson tried switch-hitting in June, but Boyer allowed Tyson to hit left-handed only when the Cardinals were ahead, or when the score was tied, in games Tyson started as a right-handed batter. Oberkfell got the starts versus right-handed pitching. “I don’t think he (Tyson) is as good a hitter left-handed as Oberkfell yet,” Boyer said. Oberkfell “has fielded almost flawlessly,” wrote Rick Hummel in The Sporting News. When Tyson stretched ligaments in his left knee, Oberkfell became the full-fledged starter for the last third of the season. Oberkfell also batted .301 in 135 games in 1979. His .396 on-base percentage was the best of his 16 years in the major leagues. He hit .305 against right-handers and .287 versus left-handers. Tyson was traded to the Cubs for reliever Donnie Moore after the 1979 season and Oberkfell remained the Cardinals’ everyday second baseman in 1980. In 1981, the Cardinals made Tommy Herr the starter at second base and moved Oberkfell to third base, where he replaced Ken Reitz, who was traded to the Cubs in the deal that brought closer Bruce Sutter to St. Louis. Oberkfell led National League third basemen in fielding percentage in 1982 (.972) and 1983 (.960). He and Herr and Sutter were key players in the Cardinals’ 1982 World Series championship season.